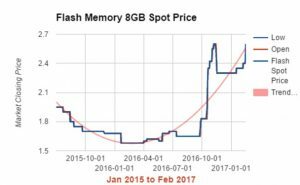 The daily spot price of (NAND) flash memory is a very volatile market. However the use of a specific kind of artificial intelligence (AI) called machine learning can be applied to better predict price movements. Predicting the price makes it possible to better manage our custom flash drives operations and keep costs of high quality USBs affordable to our customers. 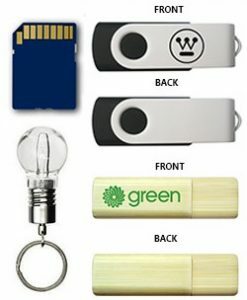 As we alluded to earlier, one of the challenges of price volatility is that it makes it very difficult to provide an accurate and affordable price to a client seeking to buy our custom flash drives. The volatility in the market has created a lot of uncertainty and can be a headache for the manufacturer and the wholesaler alike. Because of these market fluctuations, the price quotes given to our clients are only valid for a short amount of time. A good suggestion would be to have some way to estimate the flash drive prices instantly when a customer requests a quote. One of the ways to do this would be to track prices intra-day by examining a graph. We could then determine whether or not the flash price is stable, rising or falling. Another solution would be to use an AI algorithm to estimate what the price would be for the day. An AI algorithm is either a simple or very complex formula that is based on the patterns found in the data that drive flash memory price changes (e.g., new iPhone released by Apple, growing demand for mobile devices, consumers using their phone as a computer, a Toshiba flash memory factory temporarily closed due to a fire). 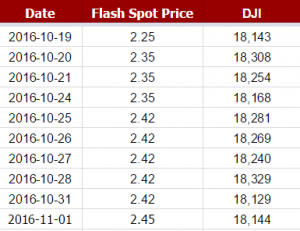 A list of flash memory spot prices could be compiled and compared with the DJIA over the same time periods to see if there is a correlation. This is one of many approaches we have taken to improve our predictive capacity using AI. We also graphed the 8GB flash memory spot price and the DJIA to see if there is a correlation between the two. We found that there is a 37% correlation between the flash memory spot price and the Dow Jones Index. What this means is that we can expect about 40% of the movement in the stock market to be associated with similar movements in flash memory market prices. In other words, we can use the movement of the Dow Jones as a rough estimate of flash market prices. This association between the stock price and flash memory prices follows common sense logic: the stock market is a measure of future economic growth and overall market demand. As demand for products and resources rise, the need for more data storage also grows, which increases flash memory demand and its price. Once enough new supply comes into the market, then prices will stabilize and possibly fall. It’s all basic Economics 101.The power of using these AI machine learning algorithms is that we can now better manage daily operations in the midst of chaos. AI provides us at least a modicum of certainty in a dynamic, fast-paced world. The use of artificial intelligence to monitor the volatility of flash market prices is key to being able to be more transparent to our customers about our custom USB flash drive prices. In turn the consumer has a brand they can trust — and at a price they can afford.